62/159 David Mumpower This was the first time I had ever seen it. While I was disappointed in the "3-D enhancements", the story was entertaining enough. 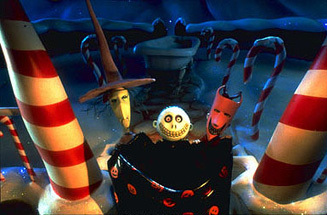 Originally released in 1993, The Nightmare Before Christmas has been such a successful franchise for Disney that the merchandise spawned by the film is among the best-selling for the company. Jack Skellington, Sally, Dr. Finkelstein and Oogie Boogie are amongst animation's most recognizable characters, which is impressive when you consider that the movie made just over $50 million in theaters. Its real, lasting life has been on video, where multiple generations have now had the chance to enjoy the highly unique story. Now, the year is 2006 and Jack Skellington and friends will be appearing on a small number of theaters in 3-D format. Just in time for Halloween, the Walt Disney Company is re-releasing the film in the same style that brought them success with 2005's Chicken Little. For those unfamiliar with the story, which was created by Tim Burton and directed by Henry Selick, the movie centers around a gentleman known as Jack Skellington, King of Halloweentown. Jack gets a little bit bored with the blase existence of being scary all the time, so he goes out to seek some other places in the universe. Upon finding Christmas Town, he simply cannot grasp the conscept because it's such a drastic difference. Skellington loves a Frankenstein-esque girl called Sally and is in conflict with a big bad known as Oogie Boogie, one of the great Disney villains ever.